The official lay confraternity of the Basilica Minore del Sto. Niño de Cebu, who primary mission is to spread the devotion to the Holy Child in the image of Señor Sto. Niño. The worship of Our Lord is universal. The devotion to the Santo Niño is a Filipino modality, national in its spirits and characteristics. To live this devotion in all its richness and efficacy and to have it spread through the entire country, to every church, to every family, to every Filipino, is the purpose and main reason of the Cofradia. To engage the Cofradia in religious and civic community activities, for the upliftment of our people. The various Chapters may further include other specific objectives in their Statutes, consonant with the objectives of the Cofradia. In the Preamble to the Constitution and By-Laws which are hereby promulgated the framers of the document specify the reasons why it was necessary to have it drawn; given the pervasive practice of the devotion to the Santo Niño among our people through the centuries and the importance of enhancing and further strengthening this devotion, the need has become imperative to organize the devotees in local Chapters and into a national body for the enlightening of the membership, for uniformity of procedures, for safeguard against extremisms and divisiveness, and for proper coordination. Awareness also that a regulatory document is only an instrument which would be lifeless without the proper response on the part of the people from whom it is intended, the legislators carefully spell out in Article 2 of the Constitution the objectives of the Cofradia which, at the personal, familial, parochial and national levels, are primarily spiritual but also social and meant to contribute to the upliftment of our people in their various dimensions. None of these objectives, however, can be achieved and fittingly sustained as a general rule without a certain measure of information and without the support of formalized expressions of devotion for both individual and community use, so that each devotee may address himself personally to the Santo Niño in love, adoration and petition or do so in spiritual and physical association with others, always conscious that throughout our country there arises everyday an all-sweeping wave of homage and adoration to Our Lord Who has chosen to bless us with the symbolic gift of the beloved Image enshrined in Cebu. It is for these reasons that the following pages are written to introduce the Constitution and By-Laws. It is also for these reasons that a Missal Senor Santo Niño has been compiled by Fr. Eduardo Perez, OSA, and, duly and gladly approved by the ecclesiastical authority, has been made available to every devotee of our Señor Santo Niño. Most images venerated in Christendom have had their origins in unverifiable legend. This, of course, does not in any manner detract from the validity of the devotion of the people and from the authenticity of many of the miracles attributed to the images, for the image is but the symbol or visible sign of the realty for which they stand. Nor does the variety of images and appellations diminish or divide the allegiance of the people to that one reality which is the one that we truly love and honor. It is the same Blessed Mother, for, instance, whom we revere in her various images and to whom we pray under various appellations and all the appellations are valid because She contains all those attributes in the splendour of her perfection. It is the same infant Jesus Whom we adore when we kneel before one or another of His images, and our preference of one image over another is justified by reasons which have to do with our inclinations, or needs, our inheritance or our place, just as the reverence of the theologian or the intellectual or the uneducated, or the grown up as well as of the child, is justified not only because we all, even in our religion, must see and feel and touch but also because we are duty-bound to worship not only with our souls but also with our senses. The image of the Santo Niño of Cebu did not come to us shrouded in the mist of legend: its origin and discovery and the sequence of events that caused its presence in Cebu have long been as well documented as any fact in the history of our country’s past can be. Still, there was in that sequence a touch of the romantic that makes the story worth telling once more, and there was in the discovery of the image a proof to the weary Spaniards that all would yet be well in a land and among people that at first appeared anything but hospitable and cordial. In truth, and for reasons the Spaniards could not fathom, all seemed to have gone wrong on the 28 April 1565 when the men of Miguel Lopez de Legazpi lit upon the beaches of Cebu. The encounter between the unfriendly inhabitants and the alien soldiers did not augur well, and Legazpi, man of peace and of prudent ways, caused the Augustinian Andres de Urdaneta land with the soldiers to attempt prevent a fight between the wary inhabitants and the soldiery, frazzled of nerves and warlike in mood after the long passage from Mexico. No one knows who provoked the fire, but much of the town was destroyed, and the population took to the hills behind. The usual search of the remaining houses ensued, but nothing of value was to be fund in any, except for one in which one of the sailors hit upon a chest bound with a cord which clearly was of Spanish make. Inside the chest a second box was found and in it a statuette clad in velvet and with a red cap on its head. Two fingers of the right hand of the statue were raised and extended as in blessing, and the left hand held a gilded globe. The image was obviously well preserved, with “just the tip of the nose rubbed off somewhat and the skin coming off its face”, and it was clear that, for whatever reasons, the image had been kept with the care afforded an object considered sacred. Veterans of European campaigns easily identified the statue as an effigy of the Holy Child Jesus, most likely of the Flemish variety, and those familiar with religious practices remembered that the devotion to the Holy Child, increasingly popular in Spain from the beginning of the XVI century, had fast spread to other countries in Europe, including the Netherlands which at the time was one of the realms of the King of Spain. It was further noticed that the customary cross was missing from the gilded globe; but there was no question that the image was Christian, and then it was brought to Legazpi he knelt before it, took it in his hands, kissed it, and proclaimed before his men that the finding of the statue was indeed an auspicious omen, announcing further that the grounds where it had been found and the surrounding area would be reserved for a church and monastery in which the Holy Child would henceforth be enshrined for the veneration of all the future generations. “I, Miguel Lopez de Legazpi, by the King’s grace Governor of these islands and Captain General of the Army and the Fleet, carrying out the orders of His Majesty, caused a fort to be built upon my arrival in Cebu to which the people could repair in case of need. Father Andres de Urdaneta, Prior of the Augustinians, who came with me in the fleet, requested me to reserve for the construction of a monastery and church the lot where the image of the Holy Child was discovered, as well as the area around it, and this I readily did. In my presence and in that of the Chief Clerk, whose signature appears below, the Prior took possession of the land, and present were also many others, none of whom raised any objection. Father Diego de Herrera, the Augustinian, who has now replaced Father Urdaneta, has asked me to make official the donation of the land, with the proper legal instrument drawn to this effect, that the Fathers may proceed to build. In consequence, I do hereby order the document to be drawn and the permission given to begin construction of the monastery and church, without hindrance from anyone. After the initial joy of the surprise, the questions of the discovery of the image posed set the imaginations playing in search of satisfying answers. By whom and when had it been brought to Cebu, to what purpose had it been left there, and why had it preserved in such curious raiments and with such evident care? Surmises of all sorts were promptly advanced, and those made regarding the essential questions were eventually to be proved correct; but the final documentary proof was to wait until Pigafetta’s chronicle was at last published in the XIX century. Of course, soon after, Magellan himself was killed on the Mactan beach. And when the Spaniards left, the Cebuanos, who had been made Christian in haste, gradually reverted to their old ways. Tradition has it that an image of the Virgin with the Child in her arms was also presented to the Queen as gift, and according to at least one version the Child was offered to Humabon, while the Virgin, more suitably perhaps, was bestowed upon the Queen. No variation in the story affects the origin of the image of the Holy Child and the cause of its presence in Cebu at Legazpi’s arrival. But there is left an intriguing aspect that no speculation will ever clarify. The image of the Virgin was later found at the bottom of a well, evidently discarded in fear or disesteem, whereas the image of the Child, whether kept in a house of distinction or in a hut of low station (for the stories do not agree on this point), was treated through the years with obvious solitude. 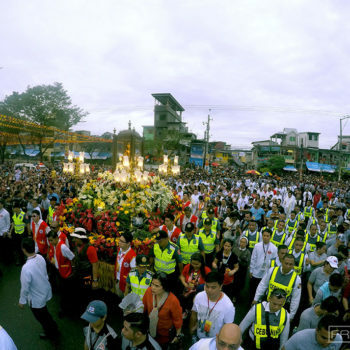 Whatever the reasons, the Santo Niño was there to preside over the beginnings of the Christianization of the country, and since, the image and the people’s devotion to it have been characteristic of our spirituality, even as they have consistently complemented the sacramental and liturgical ecclesial life which are essential elements of our Christianity. The original structure, the first church built in the country became known to Spaniard and native alike as “Santo Niño”, signifying both the building and the image. Most of Legazpi’s men soon moved to Panay and on to Manila, and through the centuries of the Spanish presence in the Philippines only a handful Spaniards, and indeed only a few Augustinians, were to reside in Cebu; but the devotion to the Santo Niño was kept vigorous and flourishing in the city and the island, even as it also spread apace wherever the Augustinians went, from the Visayas to the northern reaches of Luzon, to the point that there is hardly a town in any province or island of the country where the Santo Niño is not venerated. Still, Cebu, whose original name as a Spanish settlement as “City of the Most Holy Name of Jesus’, continues to be the center of the devotion, and it is there where it is shown in its most splendid and endearing manifestations. The first church of bamboo and nipa fell prey to fire, and so did others, more solid ones, that were built in succession. The present church and monastery were started in 1730, and the Santo Niño enthroned in his shrine on January 16, 1740. The church is colonial in style, with some elements of the Baroque. The monastery is classical of lines, with an interior patio whose arcades open to the church on one side and to the lower floor of the monastery on the other. Nothing is grandiose in the entire structure, but some of the elements are of high artistic quality, particularly the retable of the main altar and the carvings of the choir loft and of main stairway of the monastery, and the whole is open, inviting, and conducive to devotion. Great damage was caused to both church and monastery at the close of World War II. One of the bombs hit so directly that all feared for the safety of the image; but to the amazed of all, it was found hanging by its cape from one of the candles decorating the niche. Fr. Leandro Moran, OSA, rescued the image and with tender care took it through the burning city to the church of the Redemptorists. After the most elementary repairs were done, the Santo Niño returned home on April 20, 1945. 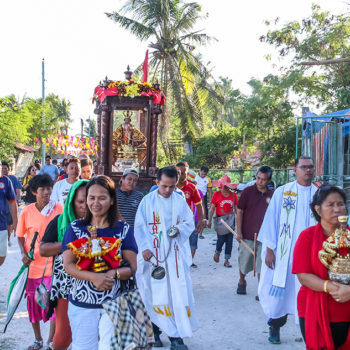 The celebration of the fourth centennial of the Christianization of the Philippines in 1965 centered, most naturally, around the Santo Niño. Church and monastery were fittingly renovated, and because of its historical, religious and national import, the shrine was given the title Basilica. In the name of Pope Paul VI, the Legate crowned canonically the image at an imposing ceremony witnessed by an immense, silent, adoring crowd gathered from every part of the country; and the following year, for the first time in history, the Santo Niño left the city of Cebu to preside over the closing rites of the centennial in Manila, again attended by a faithful people led by the President of the Republic. Finally, in November 1976, and in order to allow the devotees to approach the image without interfering with the liturgy of the Basilica proper, the Santo Niño was placed in a separate marble chapel, appointed for easy and orderly access. It has been assumed of late in certain quarters, especially after Vatican Council II, that devotional practices, as distinguished from the Mass, the sacraments, and the strictly ecclesial liturgy, should be discouraged. It was assumed, long before Vatican II, by certain people, no doubt dedicated and well-minded, that religion in the Philippines had early acquired and long preserved a sentimental, ritual ridden nature whose super session was overdue. The premise and the contention underlying both assumptions are that religion, even as practiced by ordinary people, should be based on and limited to essential theology. The results of the attempts at radical change made in the Philippines soon made the reformers realize their mistake. The present-day confused, confusing and confounding directions some theologians would have the Church take, the defections at all levels, including the priestly and religious ranks, and the puzzlement among non-Catholic which has slowed down considerably the momentum in conversions should make all pause and reconsider the validity of those compensation, of new forms of religious emotionalism which smack of fundamentalist revivals. No doubt, Pope John Paul II, as experienced in modernity as he is anchored in tradition, knows well what he is doing when he keeps speaking opportunely and, apparently, inopportunely, of the importance of the devotion to Our Blessed Mother. Certainly, a devotion to a Saint, for instance, which becomes obsessive and drives someone to enter a church and kneel before a statue while ignoring completely the Blessed Sacrament, is radically wrong. Certainly, too, a devotion can lead to fanaticism, to unnatural practices, or to mere superstition. A devotion, too, can serve as an excuse for pomp and vanity, or even as a toll for politics. But the abuse of something good cannot be construed as valid reason to get rid of the good itself. A devotion, justified in itself, must be practiced with informed mind and faith, with sincere and honest commitment, and with a sense of proportion. This means is not only how a devotion should be practiced but also, understanding what she practiced. We are minds and souls, but also something more: we are bodies and hearts and emotions and senses, as subject to physical pain as capable of aesthetic joy. We are expected, and required, to worship God and to perceived His visitation with our whole nature, just as the world is God’s handicraft but also the quarry from which we get the stuff for our symbols for art as well as for worship. It would be difficult for a man perceptive not to exult as the spark begins to light the darkness of Easter eve; it would be strange for anyone not to be drawn towards the crib of Christmas. Also, just as centuries ago men were talking about the “Great Chain of Being”, extending from God to nothingness through a gradated, ascending, and descending ladder of being in between, so there is a spiritual scale between the infinity of God and the smallness of man, with our Lord Jesus Christ, the High Pontiff or Bridge-Maker, the God Who became Man, spanning the abyss between God and man. We must never forget the Divinity of Christ, but, logically, we found much closer to His Humanity, and this justifies the appeal, or indeed the preference, we may show for certain aspects of His Humanity when we want to approach Him. Logically, too, and by extension, the Blessed Mother and, to a lesser degree, the Saints may appeal to us not only as models but also as intermediaries in the expression of our devotion and our needs. Once the premises of our faith are understood, all else follows and evolves most naturally and legitimately. The devotion to the Santo Niño, if for the moment we let pass certain flaws that may taint it somewhat, is much easier to understand and to practice than most others, and our people have shown a remarkable insight in responding so consistently to it. Touchingly human as it undoubtedly is, and very much in consonance with the deep sense of family that characterizes our life, the response is also eminently theological and firmly rooted in the Gospel. We go to the Child to find the Redeemer and the Lord, and we go to Him because before God all human greatness is reduced to smallness and it was to the children that the Lord made the promise acceptance. And unaware perhaps of the words of poets, we know well that the child is father to the man and that it is children that make the family. The whole range of the meaning and purpose of the incarnation of our Lord is involved in the devotion to the Holy Child; the whole extent of our sense of life and of family is engaged in our predilection for the Santo Niño. We worship the Infancy of the Lord not only because He came to the world as an infant, but also because He came to us as a people as a child. This is the manner He chose and this is the manner in which we have accepted and continue to accept Him. It is in name of Jesus alone that grace and salvation can be granted to mankind. By calling the Lord Santo Niño, we are expressing our will not only to accept salvation in His name but also to do so not merely out of a sense of duty but out of the affection of our heart. It was the Man of Sorrows that once, on His way to Calvary, was called in derision King; it is the smiling Child in Whom we recognize as King that He truly is and will forever be and Whom we wish enthroned, King of faith, of time and of eternity, in our lives and in our homes. We know the Santo Niño to be the Son of the Father, the God made man for the redemption of the world, the God-Man hidden in the Blessed Sacrament, the Institutor of the Sacraments and the Guarantor of the grace they confer on us for our salvation, and the Judge Who will in the end declare each one of us worthy or unworthy. We know that the image we venerate in our churches and our homes is not He, but only a symbol, a token, a reminder of the One we love and worship. And we do not for a moment forget any of these truths. But still we go before the image, day after day, at home or in church, individually or with our family or with the larger family of the faithful, knowing what the image does for us, grateful that He gave it to us as proof, as assurance of His own predilection. We know further what the image and our devotion can do for us at the levels in various other ways, regarding the loyalties, the decency, the honor and the commitments of a man, of a woman, of a child, of a growing adolescent, the unity of a family… when one and all must face every day, must say good night before retiring, in the presence of Santo Niño enthroned in the place of honor of a home. And we know that a society is the addition of many homes, of all human beings that go out every day from each of those homes in which the true nature of everyone of us is most deeply shaped. Article 1. – The religious association hereby established shall be officially known as Cofradia del Santo Nino de Cebu. To engage the Cofradia in religious and civic community activities for the upliftment of the people. The various Chapters may further include other specific objectives in their statutes, consonant with the objectives of the Cofradia. Article 3. – The insignia of the Cofradia shall be a medal with the image of Santo Nino embossed on it. Article 4. – The seal of the Cofradia shall be a circular or oval stamp with the image of Santo Nino embossed in the center and the words: “Cofradia del Santo Nino de Cebu” surrounding the image. Article 5. – The banner of the Cofradia shall be the one prescribed and issued by the National Board of Directors. Article 6. – Any Catholic, at least thirteen (13) years old may be admitted to membership in the Cofradia, provided that he/she is desirous to live in conformity with the principles and tenets of Christian morality, and not a member of an illicit sect or unlawful organization. Regular or active members are those who comply with all the duties and obligations as prescribed in the Constitution and By-Laws as well as the statutes of the Cofradia, and enjoy the corresponding rights and privileges. 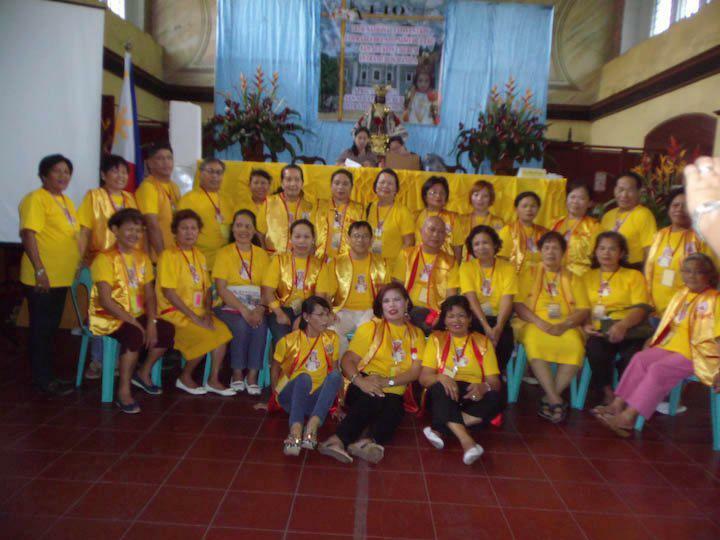 Auxiliary members are those devotees of Santo Nino who would like to wear the insignia of the Cofradia upon paying the registration fee. They cannot vote nor can be elected to any position of the Cofradia. Article 7. – The membership application, after thorough investigation and screening by the Committee on Membership, shall be endorsed for approval and forwarded to the Spiritual Director for confirmation. The new member shall be installed and conferred with the insignia of the Cofradia by the Spiritual Director or his duly authorized representative. The admission of the applicant shall be reported in writing to the National Executive Officers, attaching therewith the photocopies of the approved application and other pertinent papers. To be elected to any office, provided that the member has been of good standing for at least one year prior to the election. A member of good standing is one who has not incurred three (3) consecutive unexcused absences during the regular meetings and had fully paid the monthly membership dues. To fulfill all other obligations inherent in the membership. Article 9. – The organizational structure of the Cofradia shall consist of two levels: (1) the National Board of Directors composed of all Chapter Presidents , and (2) the Chapters (Mother Chapter and Local Chapters) in different Augustinian-run churches, educational institutions, social action centers and NGOs, as well as in non-Augustinian parishes, centers and institutions. For easier coordination and other practical considerations due to the extent of the organization, the incumbent Rector of the Basilica Minore del Santo Nino de Cebu automatically assumes the position of National Spiritual Director and concurrently as Chairman of the National Board, unless he delegates the same to the National President; and except for the three Vice Presidents, the incumbent President, Secretary, Treasurer and Auditor of the Mother Chapter shall also automatically assume the positions of national President, Secretary, Treasurer and Auditor, respectively. The National Spiritual Director shall have the power to appoint the three (3) National Vice-Presidents. The term of office of the members of the National Board shall be two (2) years. In case of vacancy of the office by reason of the incapacity, death, disqualification or any valid cause, such vacancy shall be filled up by the National Board, constituting a quorum in a special meeting called for the purpose. The officer so elected shall hold office for the remaining period of the unexpired term. To convene and preside at all meetings, regular or special, of the National Board of Directors. To exercise supervision over the chapters regarding all matters affecting Cofradia activities. To perform such other functions as are inherent to the effective management of the National Office and as the National Board of Directors may delegate or authorize. To adopt, revise, amend and ratify the constitution and by-laws of the Cofradia. To issue guidelines for all administrative and operative policies of the Cofradia. To review and evaluate the periodic reports of the Treasurer and Auditor. To create any committee, special or standing, as may be necessary or required, and to delegate to these committees certain functions of the National Board of Directors which the latter may deem fit and proper. To exercise such other acts and powers as may be deemed necessary and as may be directed by the general membership of the Cofradia. Article 13. – The National Board of Directors shall convene at least once a year during National Convention and whenever the Chairman or the President may deem it necessary. One-third (1/3) attendance of the members of the National Board of Directors shall constitute a quorum to validly proceed with the meeting and to decide and exercise the powers of the National Board of Directors. Article 14. – The headquarters of the National Board of Directors is located at the Basilica Minore del Sto. Nino de Cebu in Cebu City, Philippines. 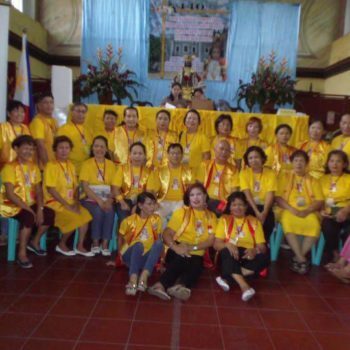 Except for the Spiritual Director, who is the Rector of the Basilica Minore del Santo Nino de Cebu, being an “ex-officio” officer, the Executive Officers shall be elected by the Mother Chapter Assembly at a meeting called for the purpose. They shall submit to the general membership periodic reports on the finances of the chapter. Article 16. – The Executive Officers shall meet regularly once a month and whenever the President may deem it necessary, or upon motion of at least three Officers. Article 17. – The Executive Officers shall hold office for a term of two (2) years., In case of vacancy due to incapacity, death or resignation, a special election shall be called to elect a successor. Article 19. – Chapters shall be created in every province, town or parish, especially those run by the Augustinians of the Province of Sto. Nino de Cebu, Philippines. c) It shall meet at least once a month, after prior due notice in writing, to discuss all matters of importance pertaining to the Cofradia. For both general and special meetings, one third (1/3) attendance shall constitute a quorum. Make final decisions regarding all spiritual, religious and liturgical matters, even as his prudent judgment shall be sought regarding all matters pertaining to the functions of the chapter. Exercise such other powers and perform such other duties as may be necessary to carry through the objectives of the Cofradia, as well as implement whatever policies may be promulgated by the National Board of Directors. Assume the office of the President should the President-elect be prevented to do so for whatever reason(s), provided that in such case, he/she will hold office only until a new President shall be elected in a special meeting held for the purpose. Exercise such other powers and perform such other duties as may be entrusted or authorized to him by the President. Take down the minutes of the regular and special meetings of the chapter. Submit a monthly report of the finances of the chapter to the Assembly or at any time that the President may deemed it necessary. Exercise such other powers and perform such other duties as may be directed or authorized by the President. Article 28. – The Executive Officers shall meet regularly at least once a month. They shall hold special meetings whenever the President may deem it convenient and necessary, or upon motion of least three (3) Officers. Attendance if at least three (3) Officers shall be sufficient to constitute a quorum. Article 29. – The Executive Officers shall hold office for two (2) years, unless they are disqualified or removed from office, and until their successors shall be duly elected and sworn in. Article 30. – The election of the Executive Officers for all the chapters shall take place every two (2) years on the month preceding the National Convention, or at any other dated determined by the particular chapters during the general meeting of the Assembly called for the purpose. To submit these names to the Spiritual Director. Article 32. – All elections, whether regular or special, shall be conducted by secret ballot under the principle of “one person, one vote”. Only members who are present during the conduct of the election shall be entitled to cast their votes. Article 34. – An officer who has served for two consecutive terms may, after the lapse of one term, be elected to any position with the privilege of one re-election. Is willing and ready to take up the position voluntarily and without remuneration. Article 36. – All incumbent Officers shall not hold any position, whether elected or appointed, in any other mandated organization of the Basilica Minore del Santo Nino de Cebu. Intentional negligence or non-compliance with his/her duties and obligations as a member. Article 38. – Any Executive Officer may be removed from his/her position on any or all of the grounds specified in the preceding article, or for unexcused absences from five (5) consecutive meetings during his/her term of office. Article 39. – All members shall pay promptly the membership fees and other annual dues stipulated by their respective chapters. The Executive Officers may impose fines and penalties for violation s of the constitution and by-laws. Article 41. – Any amendments, changes in or revisions of this Constitution and By-Laws may be effected for cause only by the National Board of Directors, and shall be in force only upon approval by the National Spiritual Director. Article 42. – This Constitution and By-Laws of the Cofradia del Santo Nino de Cebu shall take effect upon ratification by the members of the National Board of Directors and approved by the National Spiritual Director. As a means to achieve its objectives, the Cofradia has adopted a general program of activities and practices which shall be followed and implemented by all the chapters, with allowances for the circumstances of place and available facilities. Each chapter may add other activities and practices proper to the place, provided they are in consonance with the nature and objectives of the Cofradia. 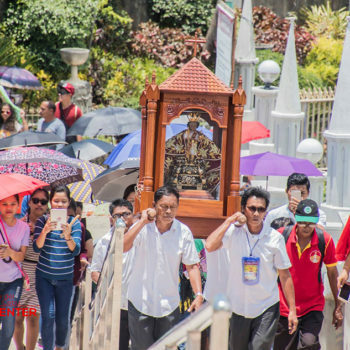 The annual feast in honor of Santo Niño shall generally be celebrated on the third Sunday of January and shall mark the highlight of the yearly activities of the Cofradia. Consequently, no efforts shall be spared to make this celebration a success. Ideally, the celebration ought to be held in close relation with all other activities of the Cofradia. B) Commemoration of the discovery of the image of Santo Niño. The commemoration of the discovery of the image of Santo Niño shall be celebrated on April 28 with appropriate religious, social and civic activities. Attendance to, or recitation of, the Novena every Friday shall be mandatory for every member of the Cofradia. 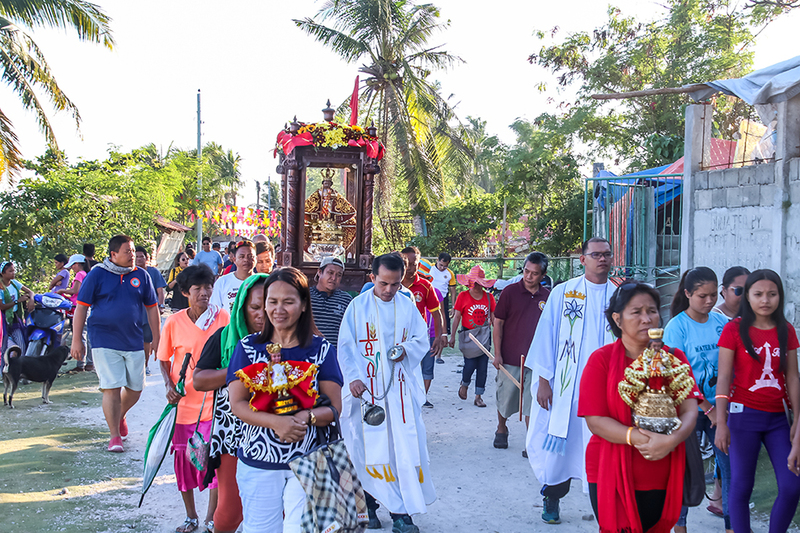 The objective of this traditional practice of the Cofradia is to strengthen the devotion to Santo Niño within the family, as well as to foster inter-family relations in the sharing of the same devotion. 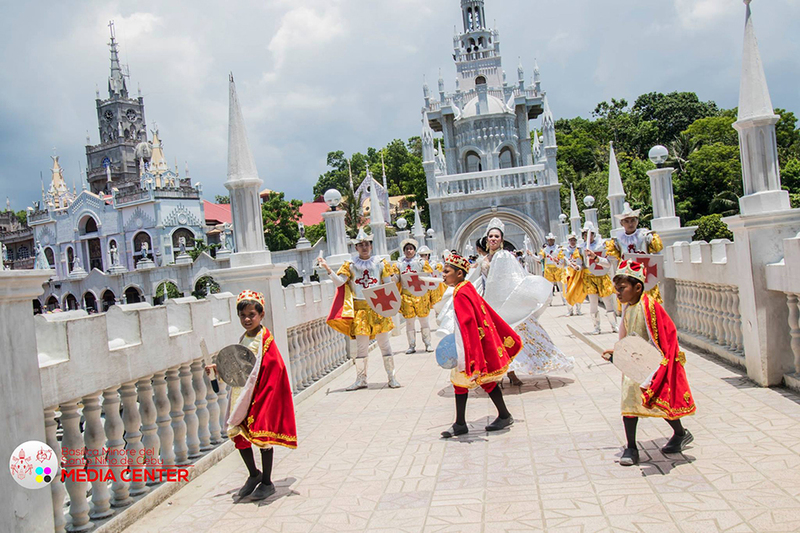 The Town Visit is designed to bring the devotion to Santo Niño to the people in order to awaken and strengthen their faith and devotion and to prepare the way toward establishing new chapters of the Cofradia everywhere in our country. Only those chapters commissioned by the National Board of Directors shall undertake this project. These chapters shall formulate the guidelines and directives to carry out the program subject to the approval of the National Spiritual Director. They will present to the National Board of Directors an annual report on the Holy Visits undertaken. Only the Manila Chapter is commissioned to undertake the Holy Visits in Luzon area. 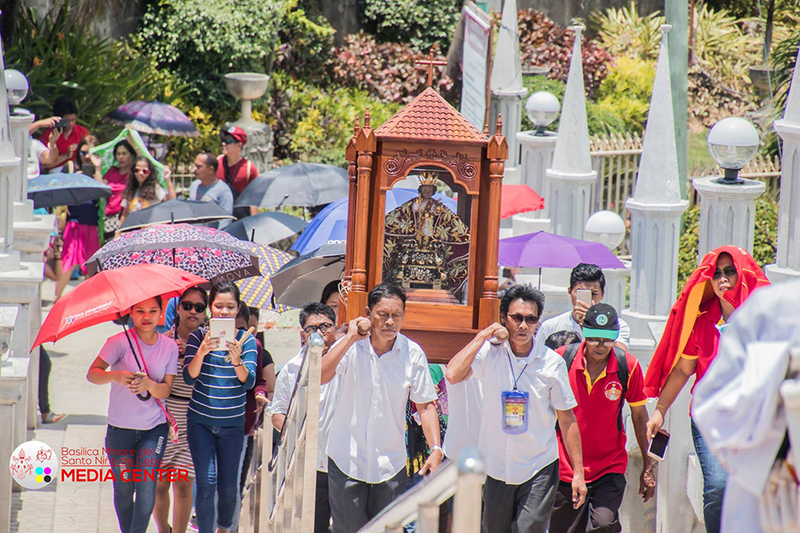 The Pilgrimage to the Santo Niño Shrine in Cebu is highly commendable for both the individual members and the chapters. Excellent as they are and commendable, the purely spiritual and devotional objectives would hardly justify the functions of the Cofradia in our time, given the social consciousness and concerns of the Church. 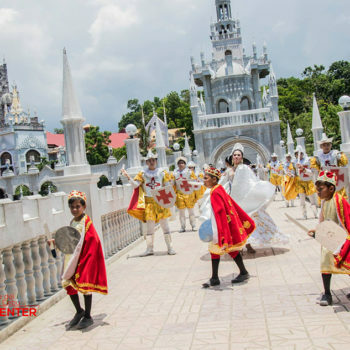 For this reason, the Cofradia del Santo Niño de Cebu must explore ways and means that are ever beneficial to the people as regards their welfare and their urgent needs. 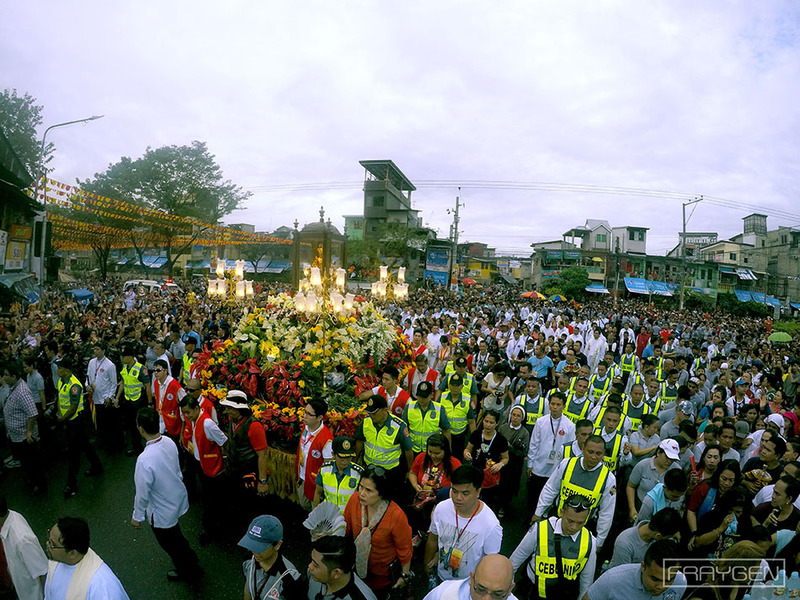 In particular, and in honor of and service to the Santo Niño, the Cofradia shall place special emphasis on sponsoring and providing aid to social and charitable institutions for children, such as orphanages, hospitals, refuge training centers, etc., channelling every year some of the available funds for these purposes, even as each members is hereby enjoined to take to heart this most laudable form of help to the children of God who need assistance. Upon approval of the organization of the new chapter, the petitioners become members of the Cofradia. Elections for the Executive Officers shall follow at a scheduled date. Oath-taking of the newly-elected Officers and the enthronement of the Santo Niño Image in the headquarters of the chapters should take place with certain solemnity and festivity. It is suggested that the National Spiritual Director be invited to the occasion. He may, however, delegate this honor to a representative.